Yup, today you’ve got a Yakov Smirnoff snowclone. I’m pretty happy with this. Even though Naked Fatty is not based on me or my life, I was disgusted enough at the ridiculous amount of pizza I ate tonight to use it as the fuel for this week’s sketch. Naked Fatty stands in green fields looking out at a giant pizza that's taken the form of the sun in the sky. 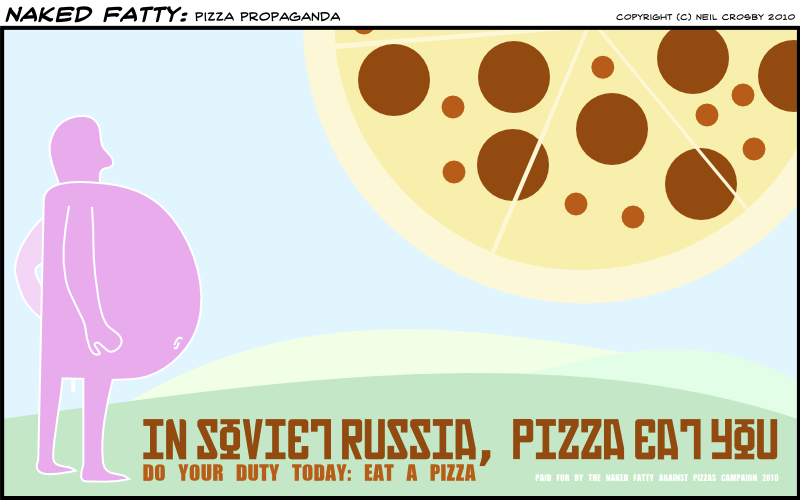 Paid for by the Naked Fatty Against Pizzas Campaign 2010.